Gov. 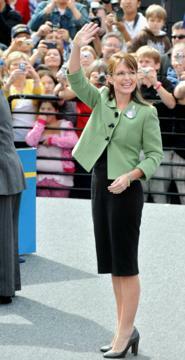 Palin after her fashion makeover in 2008. WASHINGTON (AP) – The husband of Alaska Gov. Sarah Palin says the Republican Party’s lavish spending on her wardrobe during the presidential campaign was “out of our control.” In the May issue of Men’s Journal, Todd Palin was asked about the more than $150,000 that the Republican National Committee spent on clothes, accessories and beauty services for the GOP vice presidential nominee. He defended his wife, saying she was focused on preparation for her debate with Joe Biden. The Los Angeles Times reports today that the $150,000 spent on clothes and accessories for Alaska Governor Sarah Palin and her family was from September ONLY, which would leave many of us American voters suffering through extremely difficult economic times to wonder why the Republican vice presidential candidate suddenly seems to have won the lottery? Sarah Palin, small-town hockey mom and everywoman? More like Sarah Palin, pampered princess. Jeanne Cummings at Politico reports that the RNC’s monthly financial disclosure reports reveal that the Republican National Committee has spent tens of thousands of dollars on the vice presidential candidate’s wardrobe and accessories since she was nominated, including $150,000 in September alone. So it seems you can take the girl out of the beauty pageant, but you can’t take the beauty pageant out of the girl. Palin’s clothes came from retailers such as Saks Fifth Avenue, Macy’s, Bloomingdales, Neiman Marcus and Barneys New York, and expenses included nearly $5,000 for hair and makeup. Maybe this is actually her one-woman economic stimulus plan. Lord knows the retail sector needs it. Still, voters must find it unfathomable for Palin, who has been presented as a woman “like us,” to spend that kind of money on clothes in these difficult financial times, to see her speaking so passionately about Joe the Plumber while plumbing campaign coffers for Valentino jackets and pencil skirts. And yet, they’ve eaten it up, tittering on chat sites about Palin’s Kawasaki eyeglass frames and her Naughty Monkey red peep-toe pumps. In Palin’s defense, being a woman in the public eye has its own kind of pressures. And it’s unlikely she has been stepping off the campaign trail to join the ladies who lunch for shopping sprees at Neimans. Instead, she is probably working with a wardrobe stylist, who brings her things to try on and choose from. But the issue of clothing and hair expenses has always been a land mine for politicians (John Edwards’ $400 haircuts), and someone should have been sensitive to that. You also have to wonder how it feels, as a woman, to have everyone know that you really have been dressed up and trotted out like a beauty queen for the American public to wag their tongues at. Caribou Barbie indeed.